Each day more homeowners are joining the composite deck bandwagon of landscaping – comprising good waste, fillers and recycled plastic as the ultimate low-maintenance, eco-friendly solution for their outdoor/front door spaces. Also factor in the fact that the wood grain patterns and colors of the composite family are becoming even more realistic. 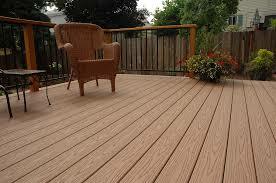 These Calgary composite decks can be adorned with rails designed from wood, glass or even stainless steel wiring. Activity-specific spaces can be added and these decks can well be built on various levels to be in sync with the natural terrain, and to lay emphasis on specific views or vistas. Well, my guess is before you make the decision to opt into the composite fever landscaping, you want to first be thorough about it. So, without further ado, let’s get slices of this new cake and get to know it pros and cons of this Calgary mouthful. Very different from wood, Composite decking in Calgary never require you to stain or sand them – what they need is occasional cleaning with soap and water or the more brilliant idea of a power wash. These decks are very good for the environment because the manufacturers of these materials use million-pounds of both pre and post-consumer waste plastic that would otherwise end up in landfills. They put recycled wood into their employ, thus saving the environmental hazards that come with the felling of new trees. So you are doing the ecosystem a greater good buy buying one of these more recent models, while enjoying the long-lasting feature they offer when compared to regular treated wood. It is also in the books that as a result of composite decks’ longevity of stay, they stay out of the landfill for a much longer time. Landscaping today have been designed to be very impermeable to water, while it is just as important to be religious with basic precautions to prevent molding. Generic advices say that they should be installed at least 24 inches above the ground for it to have sufficient ventilation – that the best way they are enjoyed. According to reliable sources, composite decks in Calgary can be cleaned of developing mildew or mold with the use of a specially designed solution which happens to be eco-friendly and instantly effective. Composites are weather resistant and they are not in the habit of splintering or rotting, compared to its treated wood counterpart. Well, you know the first – it costs more than treated wood. Yes, composite decks would demand 50 percent more cash that pressure-treated decking and somewhat more than cedar or redwood- it all depends on the lumber grade. The upfront cost is made up for in the longer run, nevertheless, as you would be thankful you have made a move to save yourself maintenance costs. Composite decking is available in various grades, and what any of them would cost you is dependent upon on some factors such as the kind of material used, the deck’s UV protection and scratch resistance – mentioning only a few. Composite deck landscaping takes higher numbers when put on a scale than wood per linear foot, while woods are not as strong. A good number of manufacturers call for 16 inches on center framing for straight runs and 12 inches on center for diagonal runs. Composite decking is not really a structured product but it is usually installed over a frame of pressure treated lumber. The deck can be stained by with cooking grease and the plastic can be melted by hot coals. You also need to keep in mind while buying that the boards which are attached with hidden fasteners are especially hard to replace. These hidden fasteners can be fastened using a system of clips hidden beneath the decking, which adds a little cost. But it does give the deck a cleaner appearance, and it happens to be more permanent than the fastening system. Some problems also associated with composite decks is that a number of them may look obviously fake or cheap and some brands can be slippery to walk on. When they are put under shades in Calgary and other regions, these much lauded decks are not resistant to molds and mildews, after which they will likely show signs of ageing and decay.